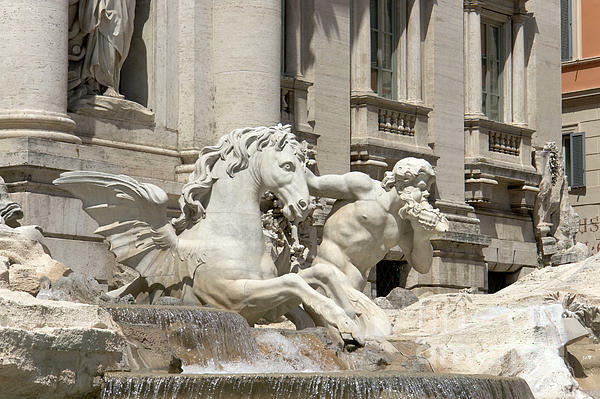 The Trevi Fountain is at the ending part of the Aqua Virgo, an aqueduct constructed in 19 BC. It brings water all the way from the Salone Springs (approx 20km from Rome) and supplies the fountains in the historic center of Rome with water. 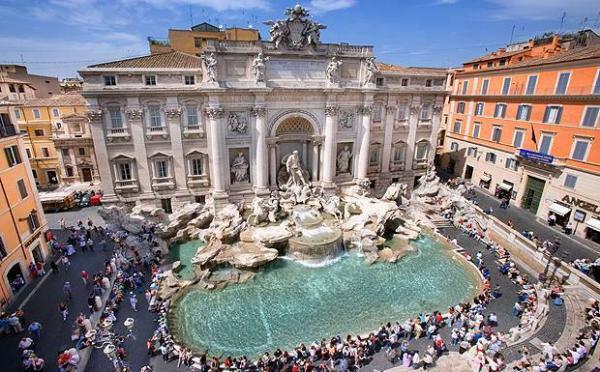 In 1732, Pope Clement XII commissioned Nicola Salvi to create a large fountain at the Trevi Square. A previous undertaking to build the fountain after a design by Bernini was halted a century earlier after the death of Pope Urban VIII. Salvi based his theatrical masterpiece on this design. Construction of the monumental baroque fountain was finally completed in 1762. The central figure of the fountain, in front of a large niche, is Neptune, god of the sea. He is riding a chariot in the shape of a shell, pulled by two sea horses. Each sea horse is guided by a Triton. One of the horses is calm and obedient, the other one restive. They symbolize the fluctuating moods of the sea. On the left hand side of Neptune is a statue representing Abundance, the statue on the right represents Salubrity. Above the sculptures are bas-reliefs, one of them shows Agrippa, the girl after whom the aqueduct was named. The water at the bottom of the fountain represents the sea. Legend has it you will return to Rome if you throw a coin into the water. You should toss it over your shoulder with your back to the fountain.